In a moment of admitted self-indulgence, the blogger interviews himself. Hey, Doug! Did you irritate some PR people last week?!? It’s kind of the story of my life. The publicists / handlers for Jason Carter and Michelle Nunn, the Democrats running for Governor and US Senate in Georgia. In both instances, I was trying to access and interview ex-presidents who had attended and spoke at events on behalf of their candidates. The publicists didn’t want me to do that. 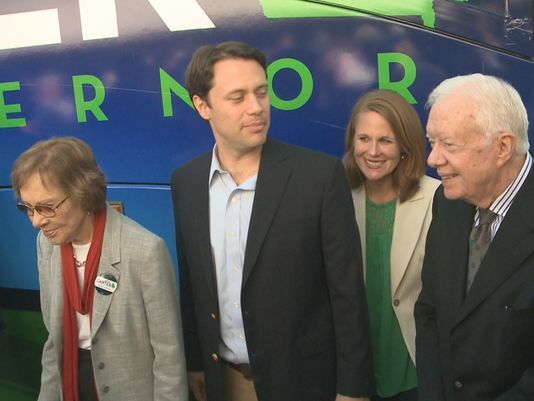 In Columbus GA, Jason Carter held a public rally with his grandfather Jimmy Carter. After we arrived, the candidate’s PR guy, Bryan Thomas, said President Carter wouldn’t be doing any interviews. Well– yeah! After their speeches, President Carter worked a rope line in front of the stage, shaking hands with folks. Photog Mike Zakel and I went to the rope line. President Carter was right in front of us. I asked him a couple of questions. He kind of answered, kinda didn’t. And that angered the campaign guy? Afterward, Thomas snarled that I was “out of line.” Some other reporters were griping to him that they didn’t get the chance to question Carter that I did. Yes and no. The material was barely usable. Carter, at age 90, is still sharper than I will ever be, but he’s very softspoken. There was music thumping in the background, so the audio wasn’t clean. After my piece aired, a manager told me that I looked like I was ambushing an elderly man, suggesting it was not a very attractive moment for me. There’s a principle involved. An ex-president is a public person. He was at an event open to the public. 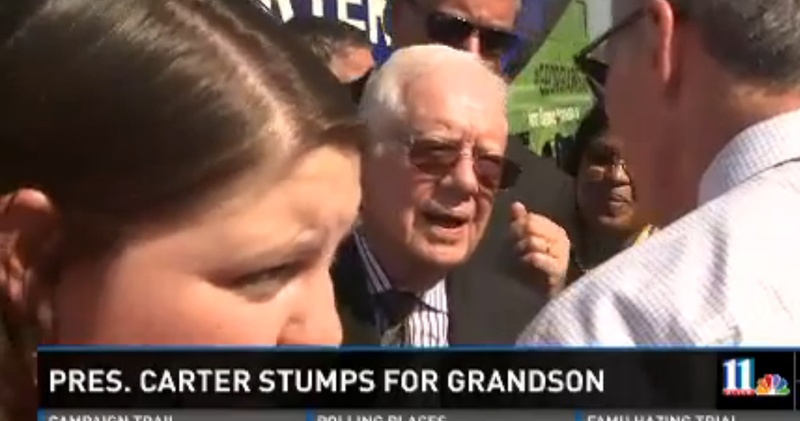 Jimmy Carter has answered very few questions about his grandson’s campaign, mostly with newspaper folk. Carter is smart and experienced. If he wanted to talk to a local TV news goon at a rope line, he would have. And Carter knows how to say “no.” But it was his decision, not the campaign’s. And then you did it again? The Carter event was Monday. 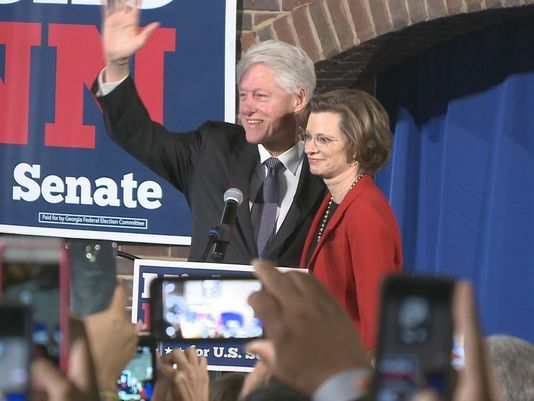 Friday, Bill Clinton stumped on behalf of Michelle Nunn. And they didn’t want you to interview Clinton? Before the event started, Nunn’s communications guy Nathan Click said Clinton wasn’t doing any interviews. I wonder why a campaign wouldn’t want an ex-president to do any interviews? Campaigns are all about controlling their message. They seem to mostly view the news media as an uncontrollable presence capable of getting unflattering stories spread online. Frequently, Nunn’s campaign held events this year that got little to no advance notice, keeping the media away so that the campaign could control the message. So, same scenario as Carter? Kind of. 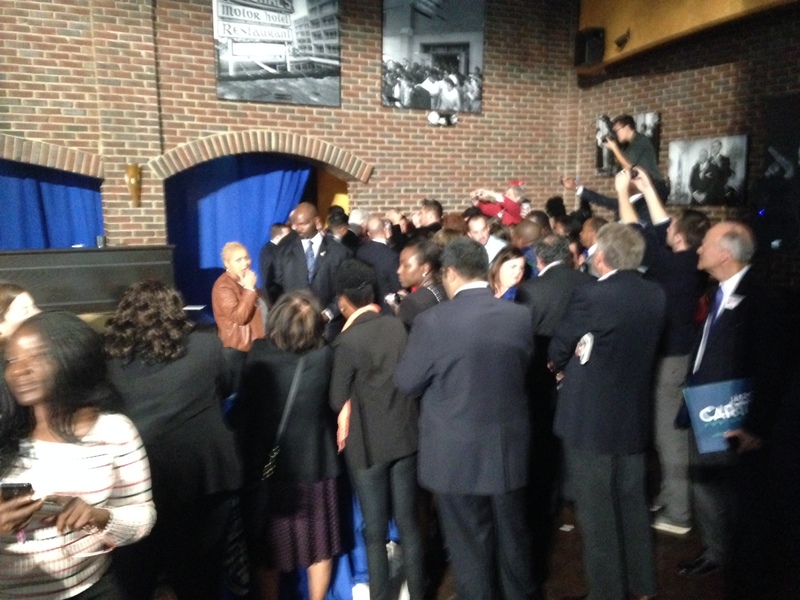 A rope line formed at the front, near the podium, as the room filled up. There was a riser in the back, overcrowded with photographers. An hour before the event started, I went to the rope line. I saw some people there I knew. I also had a wireless mic with me. Zakel stayed on the riser with his camera. Seems pretty harmless so far. Nunn had a bunch of handlers there. One of them picked me out of the crowd and ordered me back to the riser. Since the event hadn’t started, I persuaded her to let me chat with my acquaintances, one of whom was an old WAGA coworker. The handler allowed me to chat with her for a few more minutes and stood there the whole time. Did you stay at the rope line? The distant corner of the room where I wanted to chat with Clinton, as viewed from the riser. I probably would have if the Nunn people hadn’t been so adamant about my departure. I had nothing to gain by stalking an empty podium, so I figured I would go back to the riser and try the rope line again after the speechmaking ended. So the public was allowed to wander the room, but you weren’t? Yes. As is often the case nowadays, having a press pass actually gives the holder less access than the general public has. It’s BS. Out of principle, it must be resisted. You sound mighty high-minded there with your “principle.” A lot of news media haters would view that as an oxymoron. Not my fault some people give my business a bad name. The principle is the news media is merely an extension of the general public, except that we write about / document events. It means that because the general public can take pictures, shoot video and write whatever they want, those of us in the professional media must insist on the same kind of access the general public has. Or more. But never less. Plus, one can argue that any political campaign that talks about the value of transparency in the public arena is being a bit inconsistent when it curbs media access at events that are open to the public. So you stayed in your little news media area like a good boy? After the event ended, I broke free of the riser and made my way to the rope line with my wireless mic. It took about a minute for a Nunn handler to order me away. I resisted, arguing that I can go where the general public is allowed. Meantime, President Clinton was working the rope line and slowly approaching my spot. There were several discussions with three different Nunn handlers. I rejected the suggestion that I had agreed to stay on the riser; no such restriction was made in advance of the event. Then they said the Secret Service didn’t want me on the rope line, which I knew to be baloney (if the Secret Service wanted me gone, I’d have been visited by a guy who talked into his wrist, not a fresh-faced campaign staffer). Then they said “New York” didn’t want me there. Turned out “New York” was the Clinton Global Initiative. I judged that to be baloney too. Meantime, Clinton is getting closer. You really thought you were going to interview that guy? I’d done it before at rope lines. Each time, I asked a question or two and Clinton answered in far more length than I could possibly use. The guy likes to talk and he’s good at it. It’s the reason he was there for Nunn. So you stayed and interviewed Clinton? No. I retreated back to the riser. I began to weigh my circumstances. Zakel’s camera was still at the riser, forty feet away. He and the rest of the photogs stayed put when the Nunn people told them to do so. The noise level was high; there was loud music playing as Clinton worked the rope line. 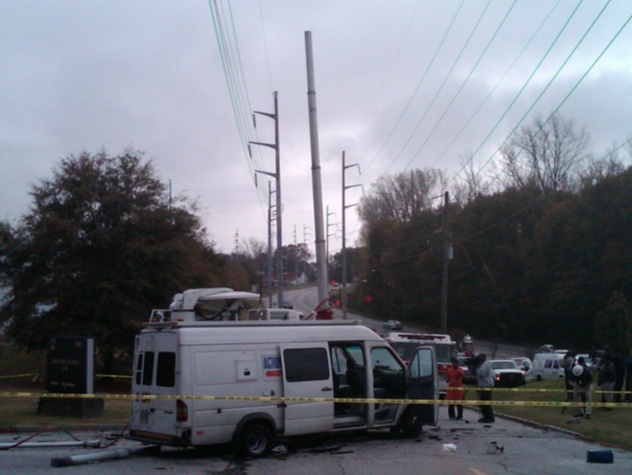 I figured my odds of getting usable material was slim, especially if the Nunn people ratcheted up their interference. Meantime, an argument formed in my head that the Nunn people should have made, but didn’t: This was a ticketed event. 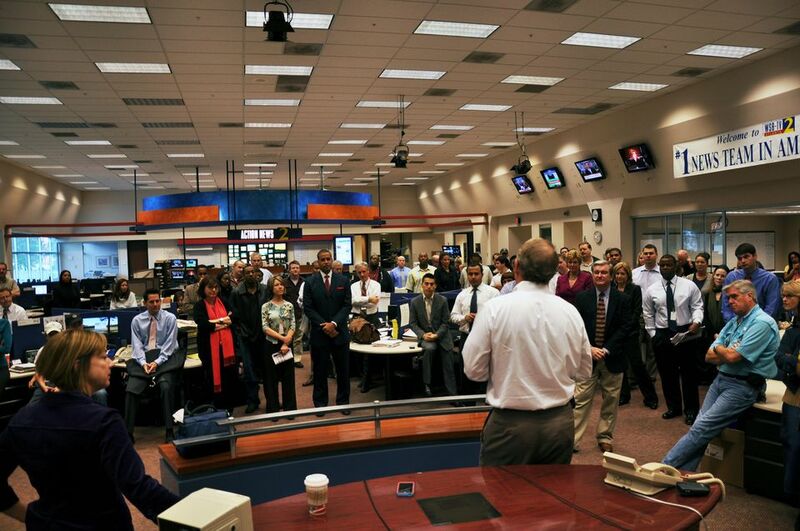 Everybody in the room had been invited by the Nunn campaign, including me. So this wasn’t a “public” event per se. I was there as Nunn’s guest. I was somewhat obliged to play nice, even though no ground rules were laid out prior to my acceptance of their invitation. So they were right and you were wrong? No! I was right and they were wrong. I was doing my job by trying to interview Clinton. I was right in attempting to access the same space accessed by the general public. They should have allowed it, in the spirit of accessibility and transparency. The “rope line” interview is commonplace. I am happy to respectfully entertain contrasting opinions in the comments section below. So you retreated in shame, and the Nunn people were still angry at you. They never said they were. Like most political campaigns, they’re pretty good at shaking off stuff like this. But the whole thing was awkward, and a bit chilly afterward. What would you have asked Clinton? Still not sure about that, but I’m sure Clinton would have answered at length and added something interesting to the story. Last question: Are you awesome, or what? This entry was posted in WXIA and tagged Bill Clinton, Jimmy Carter, Michelle Nunn, President Carter on November 3, 2014 by live apt fire.